See how stores like yours are seeing sales success by automating their marketing with Marsello. Grin Natural have seen a 190.71% increase in total membership signups to their loyalty program. Since joining Marsello, Peticular have seen loyalty customer’s purchases increase by 159%. With a customer satisfaction rating of 97%, Buda Juice are providing proven high-quality customer service and it shows. CreaLunch have doubled their customers' average spend per order with their loyalty program. Francesa has seen a 4.83% increase in sales with email flows thanking first-time customers for shopping. Francesca Jewelry was founded in 2011 by Hannah, who was designing hand-crafted pieces while she studied towards a science law degree. As the business grew, her sister Rachel joined her. The sisters design Francesca's collections together, creating a perfect mixture of both their styles, edgy and classic, and becoming know for their 'Franc Stacks' which incorporate beautiful natural stones. Francesesca began as a small stall in Tasmania's famed Salamanca Market, and has grown significantly, now with a popular online store and two brick-and-mortar shops in Tasmania and Melbourne. 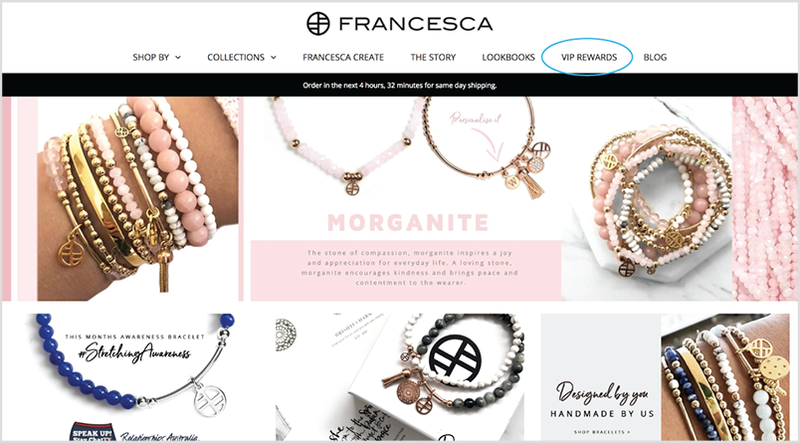 Francesca's uses Marsello to deliver their generous Loyalty Program as a way to say "thanks for the love" and to help encourage their members’ obsession for Francesca. With each purchase in-store or online, their members earn points to unlock exclusive products and future discounts, even unlocking multiple opportunities for free signature jewellery pieces. 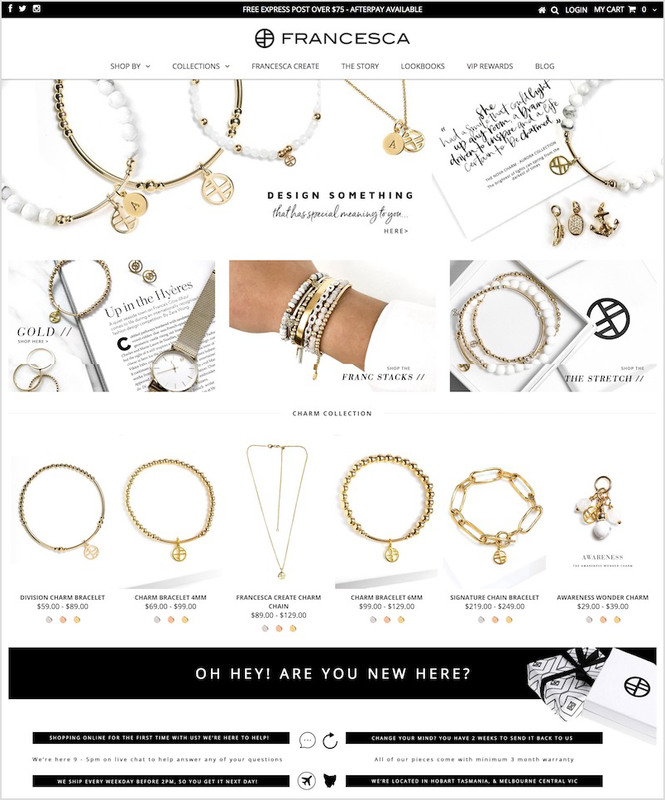 As we can see from the widget above, Francesca have made sure to customize their loyalty program and widget to show their unique style, cleverly show some of their beauitful range, and promote their brand. They have also strategically placed their loyalty program around their online store. They've added it into their store navigation, as well as a 'docked' loyalty tab linked to their widget which floats at the bottom of each of their store pages – this makes their VIP Rewards nice and easy for their members to find. Hannah and Rachel work hard to create a consistent brand experience for their customers across both their online store and brick-and-mortar stores. They run their loyalty program across both to make sure their members earn for purchasing however they choose and to make it easy for them to redeem rewards. It makes sense too – how many times have you seen something online, realised you can check it out in store, and seeing the item has convinced you to complete the purchase plus enticed you to buy more? Another way that Hannah and Rachel create a consistent brand experience is their promotion of both their brick-and-mortar and online stores. In their online store, they have a banner image of their brick-and-mortar stores with their locations. This helps tie the stores together, as well as letting their customers know they have the option to see their products in-person, and as we know, this is a solid way to convince customers to buy more and keep coming back. Francesca are currently supporting a number of different charities. Every time their customers shop with Francesca, they give back. Francesca are using i=change to donate one dollar of every online purchase towards one of their life-changing projects. Francesca also have a Shop For Awareness collection. In this collection, they have a variety of charity pieces, with a percentage of every piece purchased going towards the chosen charity. 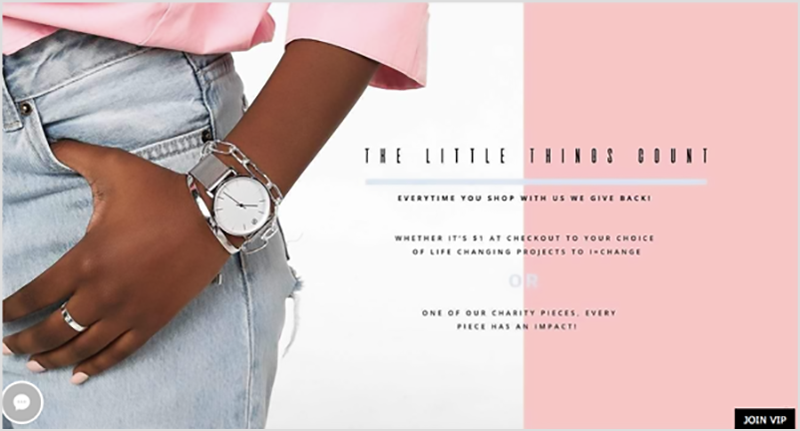 The banner that heads this page even gives a clear infographic of how much money has been raised for each charity and offers a hashtag to share on social media, helping customers to feel even more connected to the Francesca community. Each purchase is also beautifully packaged with a little thank-you and proof-of-donation note.